Secret Spring Giveaway: Offhand Bag! Yes that’s right, the extremely generous Larisa Flint Snydal of Offhand Designs and Sage Luxury has donated a Kazul Voyager Bag as a giveaway to the knittyBlog. I reviewed the Kazul in the latest issue of Knitty and it is a fantastic spacious bag with my favorite doctor’s bag frame. It comes in 12 different luxurious fabrics and the winner of this giveaway will get to pick whichever one they’d like. Regular contest rules: leave a comment on this post between now and midnight eastern time, Tuesday, April 29h. One comment will be chosen at random to answer a skill testing question. If the commenter answers correctly they will win the bag. If you have already won a prize from us in the past year, please do give other knitters a chance. Prize value $320. Oh that’s a great looking bag! YAY for giveaways! Thank you, OHD & Knitty!! Oooo, lovely, and plenty of room for the knitting! Looks like a great bag! Would love to win one. It is a lovely bag, please enter me into the draw. What a wonderful bag! Thanks so much for having contests! I would love to have an Offhand Designs bag! Wow! Found on twitter. Excellent giveaway. Will retweet, too. What a beautiful bag. Lucky person to win it. Hope it’s me…. Soooo purdy! It would fit my knitting AND wee Eddie’s diapers! I would LOVE to win an Offhand bag! They are beyond lovely! I had to sell the one I briefly owned. OHD makes such wonderful bags! Thanks for this opportunity! I’d love to win this bag! I absolutely love Offhand Designs! Have several ohd bags. Great prize! I’m an Offhand Designs fan, and I’ve had my eye on the Kazul bag for a while. Thanks for this great giveaway! That is a fine looking bag. All offhand designs are fantastic. Is the secret the giveaway, or is it spring itself? Cause around here, it’s the latter. How wonderfully generous of Ms. Snydal to offer this bag as a prize! When I read your review, the one thing that kept running through my mind was: Wow! Which fabric would I choose? I want one in each print!! Beautiful bag, thanks for the awesome giveaway! The bag is beautiful! Thanks for offering it as a give-away! Wow! So many uses for a bag like that. Thanks for the chance to win a lovely bag! I was just admiring that beautiful bag online earlier this week! Thank you for offering this gorgeous giveaway. I hope I’m the lucky giveaway-ee! Beautiful bag! I love Offhand Design Bags! Oh, that is a LOVELY bag. Fun giveaway! I could definitely provide a good home for that bag! Very cool, thanks for the contest! What a gorgeous bag! Thank you for the giveaway. I just went to take a gander at the fabric options, thinking it would be very difficult to choose…but nope. Byzantine. Far and away the best. I love that it is big AND gorgeous! Another fabulous bag from OHD! Thanks for your generosity. Ooh, what a lovely bag! YES!!! for the love of all that is holy yes!!! love the dr’s bag layout. Looks like a bag that holds half of the household – perfect! Another great bag – and you can never have too many of those! Wow!! What a sweet deal!! Wow! A chance to win one of those gorgeous bags…. Count me in, please! Wow! Would love to win this bag. Thank you for the great give-away. Fingers crossed,toes crossed…EVERYTHING crossed! Thank you for the fabulous opportunity! oooooh – Lovely, lovely bag! Oh, what a beautiful bag!!! And what a generous prize offer! fingers and toes crossed …. Sounds like a scrumptious bag. I’d love a chance to try it out. Scrumptious! Incredible thoughtfulness from Larisa, thank you. I LOVE Offhand Designs and Sage Luxury! If I am lucky enough to win I promise to take my bag on fabulous adventures. Thank you! Oh that bag! How beautiful!! So awesome! I have never won before, dear Universe! Bag lust! I have always wanted one of their bags! The world is a happier place when it is filled with fantastic things like wonderful bags. Oh, Byzantine is georgeous! Have always wanted an Offhand! Lovely – just in time to replace the bag I spilt tea over this morning on the streetcar. Knitty & Offhand Bags (Sage Luxury) what a fabulous partnership. Great Bag. Wow, what a great bag! Thanks for the chance to win! Oh! OH! OH! speechless! wordless! Hope Hope Hope! This bag generates a serious bag lust rush. Would love to be picked to win it. Oooh, what a beautiful bag! Love the bag – you can never have too many! It looks like it would be perfect for traveling, too. I have no idea how I would ever choose just one fabric! Ooh, I would love to win this nifty bag! Think of all the yarn it could hold! I have been lusting after these bags ever since I read your review. This is an incredibly generous give away! I could fill that up with yarn pretty fast. Thanks for the opportunity to win one. What a fabulous bag! Thanks so much. So gorgeous. So much want. Love it. Awesome bag. I could really use this bag. Pick me, pick me! That’s a fantastic bag!! Wow! Gorgeous bags! I think it would be an excellent overnight bag, including space for my latest knitting. Could really use one. So many gorgeous fabrics! How to choose? what a great bag – I love their style and functionality. fingers crossed for me to win!!!! I’d take that bag EVERYWHERE! Just gorgeous, fabulous and practical, too! I’m pretty sure the cats couldn’t raid *this* bag! Love it! Wow, a beautiful bag to hold all my beautiful yarns and projects I am working on, (like to work on more than 1 at a time!). Love it! Thanks for the chance to win it! Love! And I guess the sympathy card is wasted in a randomly-selected contest, but I’m going through an awful time and could really use the pick-me-up. I LOVE Sage Luxury Bags. Bought one for my highly discerning German MIL (she was totally wowed). Anyway, after one look at the quality of the craftsmanship and cleverness of the design, I ordered one for myself. Then another. A bit of a beating to my budget, so I’m on bag hold right now–with no regrets :>). Oh yes please! Pretty new bag for spring, feeling the Knitty love! Great bag! Thank you for the giveaway! I would love to win an Offhand design bag! They are lovely! What a great giveaway, very generous— I would so love to own this Offhand Designs bag! Well, carrying that would certainly be a nice statement and an artistic replacement to my trusty old carry on bag! What a gorgeous bag – cross body and shoulder options are great. A beautiful bag to carry my sweater-in-progress is just what I need! Great giveaway! Ooh, that’s pretty! What a wonderful prize. Ohhhh-I could fill that with my knitting & look so glamorous! A stunning bag and an amazing opportunity! Thanks for a chance to win! that’s a poppin bag if I’ve ever seen one! One could always use more bags! Looks beautiful and practical. Would be nice to have something more organized than a big bag with all my sundries floating around in the bottom under my knitting. Absolutely gorgeous. I’d love one! Would love to win this awesome bag….. These beautiful bags have put me in the poor house… Love them! Ooh, do I need another bag? YES! Gorgeous bag! It would be fun to win one. I am in love with the bag and as always, with Knitty! I’m not usually gaga for bags, but these are lovely! What a great give-a-way! Thank you!!!!! That’s an awesome bag. My fingers are crossed. That is a fantastic accessory! How generous of her to be giving one away. Beautiful – What a great spring treat! Lucky us to have an opportunity to win this! They’re all beautiful! I need something better than Aldis bags to carry my knitting in! Why are bags so alluring? And why should it matter? This one is fantastic, and anyone who wins this is extremely fortunate. Thank you for supplying such a nice gift! So delicious. Excuse me while I quietly drool. Oh, I hope I win. What a great bag! Thank you for the opportunity. What a beautiful bag! All of the fabrics are gorgeous. Thanks for the contest! What an extra special contest! Lovely, lovely bag. I was just saying, I need a new bag! Wow! That is a great bag. And such a generous giveaway. Thank you for the giveaway of such a great bag. What a nice looking bag! That is a great size and the fabrics are beautiful. I always like the doctor’s bag frame. What a gorgeous bag! I love bags that will stay open! This is a stunning bag! I’m a sucker for a patterned accessory – especially one that looks like it’d fit a decent amount of knitting in it. Wow, that’s a great bag! Looks like it could hold a crazy amount of stuff. This bag is an absolute dream! Thank you so much for the opportunity to win it! Love all things Offhand Design and Knitty! Wow! That is an amazing bag!! Ohhh! So pretty and useful! That is a beautiful functional bag. I would love to win it and to proudly carry it everywhere. Perfect timing – I just started looking for a better bag! Love OD bags! This one’s a beauty! These bags look fantastic! Just think how much yarn you could fit in one! What a great bag for big projects! I absolutely love my Scotty bag from Offhand Designs. Would love to when this for my mom and she has been wanting since I got mine. I was just thinking the other day that I need a larger bag for my afghan projects. This would be perfect! Thank you for the giveaway. What a beautiful bag – and such nice fabric combinations. Thanks for this giveaway offer. I am in awe. I lust after this lovely bag. Please enter me. This looks great! If you’ll ship international I’m in for the drawing. If it’s not possible then just leave me out. such beautiful products! thanks for the chance! What a gorgeous bag — and the color choices could keep me changing my mind forever! LOL! I love all of the color choices in this bag. My favorite is the Ravenna bag. Beautiful and functional. What more could anyone ask? Great bag! It’s my birthday and this would be a great gift! One can never have too many bags. I wish they had closer up shots of the fabric. I’m not familiar with the types of fabric and seeing them closer up would give me a better idea of their textures. I love it…keeping my fingers crossed that I win! I just had a birthday & this would be a lovely birthday present for ME! Love the bag. So gorgeous. Would love to win. Thanks. What an amazing giveaway! I drool over these bags all the time! What a terrific bag! Thank you for the lovely giveaway. I don’t have a designer bag and would be proud to carry one so beautiful! My relationship with bags can be summed up as “GOTTA CATCH EM ALL”, so I’d love to add this one to the herd! I would really LOVE this bag! And the ability choose the fabric would make it so extra-special. It looks really roomy and practical. Offhand Bags remind me of home. I’m originally from the Bay Area and I went to high school in Oakland. The designs encapselate the Oakland style– unique, classy, clean lines, and swaggalicious. How practical and stylish!! Thanks for a great giveaway! Stunning!! I’d marry this bag! This bag is so lovely! I bet it would hold plenty! Offhand, I’d say I would like to win this Voyager Bag. Hope springs eternal. Wow; great bag! Thanks for a chance to win one! I’ve admired Offhand Bags for a while and would LOVE to win! One word sums up this bag, GORGEOUS!!!!! Thanks for the giveaway, I have my fingers and toes crossed. Wow! That bag is fantastic. Oh my, these are quite lovely! Oh my stars, I absolutely NEED this bag. It’s perfect for my projects and still stylish! Octavia is calling my name!! woop woop!! Pick me!! Love the bag!! Who doesn’t like a new bag? Yes, I am a fan of this Offhand designed bag…. I have never had the pleasure of winning. But I would LOVE to have this opportunity to tell you how much these bags influence me to KNIT!! Finally a chance at “bag charming”! Me!me!me! I never win anything! Even at poker! Love the bag! This is my kind of bag and I would love to win! Thanks so much for the giveaway. would love to carry around all my knitting projects in that bag! Thanks for the give a way. Ooh, I love all the fabrics! I am a self-professed bag whore. I am drooling over these beautiful patterns! Would be ever so thrilled to win! Always nice to have another bag! One can never have too many bags… and that is one sweet bag! Wow, that is a gorgeous bag! I’ve loved all the Offhand Designs bags Knitty reviews; one of my own would be fabulous! That bag looks wonderful! I have a hard time finding bags that meet my needs – this one may just be it. Thanks! I love their designs, great giveaway! What a great bag–I hope I win! I wonder what the skill question will be…. That is such a lovely bag. Here’s hoping…. would love to use this bag!! I would love this bag!! Thank you for the opportunity. What a nice, big bag! Would love to win one of these beautiful bags! Thank you! I love all things knitting, But I especially love a great knitting bag! Wow, what a special prize. Put me in and thanks! I love Offhand Design Bags and would love to add this one to my collection. Gorgeous. That bag is absolutely lovely! Want, want, want! Oooh la la! Pick me! Pick me!! What a gorgeous bag! I would love to have it! Yes please! I’d love to win this. Looks like a great knitting bag! Thanks for the giveaway!! What a beautiful bag. I would love to win one! This looks like the best sort of multitasking bag. Cheers to Knitty and the designer! I desperately need another bag. These fabrics are beautiful! Thanks for offering this, Jillian and Larisa! What a fabulous bag!! I LOVE bags. A girl can never have too many stylish ways to carry around a few works in progress! I love the Offhand Design bags! That is one beautiful bag. I would be honored to own it. Maybe i’ll stop using bags with velcro that snag yarn now! I THINK I’d pick Byzantine, but I’d be torn about not picking Aurelia. I just can’t say no to turquoise. Gorgeous! I am thrilled when bags have dedicated spots for my keys and cellphone on the outside. The fabrics are wonderful, Ithink it would be tough to choose a favorite! Gorgeous, beautifully-designed bags. Pulling my knitting out of this would make knitting even more satisfying! Great knitting bags are tough to find. I’d love to win this one! I love knitting bags!! The Aurelia print has some of my favorite colors in it. Gorgeous! I’d love to win that! AWESOME bag:-) would love to win one!! Functional and beautiful!!! Took a look at the fabrics it comes in–they’re all beautiful. Wow, wow, wow–so gorgeous. What a terrific giveaway! What a 2wonderful give-a-way. So very nice of Larisa to do this for us. Thanks to all for the chance. What a beautiful bag. It will be a great gift to the lucky one who wins it. Thanks for the generous giveaway! One can never have too many quality bags! I have been wishing for a bag like that! That is a beautiful bag for spring. Oh now that is an amazing prize! Lovely! I need a new knitting bag. Lovely bag. I’m curious about the skill testing, too. WOW! What an amazingly generous give away. You guys and Offhand Designs rock! Oh my – what a gorgeous bag! Thanks for this give-away ; it is really a luxury bag ! I dream for the Byzantine, because I am a blue-fanatic. Love it! Thanks for the opportunity. Ooooo ooooo oooo. Pick me, pick me! Seriously tho, beautiful bags and I’d love to own one. I love the one pictured! Such a beautiful bag! Very generous of Ms. Snydal to offer one. What a lovely bag. I would be thrilled to use it. I need a new bag so please count me in! I would love to win this. It’s gorgeous! What a nice bag, I’d love to have one. Incredibly nice bag! Lovely colors! Oh my! This would be an amazing addition to my project bag collection. It’s a must have. Would that this bag were mine! It’s lovely and something without Velcro would be right up my alley. Thanks to all for offering it! Gorgeous, gorgeous, gorgeous! Thanks to Larisa for the awesomely generous giveaway. What a great way to tote a WIP. What a generous giveaway! Thank you for your generosity! Wow! Do I ever need this bag! Thanks for the chance….. This bag looks amazing! I’m certain I can fill it up quite nicely. I love these designs, what an awesome giveaway! What an amazing giveaway! Those bags are gorgeous! What a great giveaway! Those are beautiful bags. Wow–what a modern looking bag. I never had a bag exclusively for my knitting. Would be a nice one to win—hmmm, what color? Oh, I hope you pick me!!! What a beautiful bag. Now I’ll go drool on the 12 colors. Byzantine… Ravenna. Byzantine… Ravenna… Hmm. Those are beautiful! What luxurious prints! Beautiful. My current knitting bag has just about worn out, so this would be a perfect replacement. Awesome bags! Any knitter would be styling with that bag. Love your blog! What a beautiful bag!! Thank you for the generous giveaway. GORGEOUS! I can use a bag like this. That’s a lovely bag! I’d love to win one! Thank you for the wonderful offer. These bags are divine and I would love the chance to win one! OHD bags are fabulous! My fingers are crossed. Beautiful bags! And so useful! Oooh, I would LOVE one of these! What a beautiful bag, lucky project to be carried around in such style! I really could use a knitting bag. What beautiful bags! Thank you for the contest! What a a great bag. Never enough bags for me! Wow. Those are beautiful. I’ll keep my fingers crossed. This would be a wonderful bag to carry my work around in as I ride the bus! I need a new bag SO BAD! Wow! What a great bag! Who wouldn’t love to have one? what a graduation present this would be! Those bags are truly fabulous. And truly out of my budget. Fingers crossed! I wouldn’t mind taking that bag with me on my travels this summer. What a lovely bag. I know it could find a place in my life. This bag is amazing! Exactly what I need. That is such a gorgeous bag in such great fabrics! Really like the bag fabrics–and the little inside pockets–sweet! The bag is truly beautiful! That is a really great bag, I could use a really good bag! I went to look at the bags and each one I saw was nicer than the last! Choosing a fabric would be hard (but fun). I am so excited to see the new design and love the style of the bags! Thanks for highlighting them and offering a opportunity to win one! Oh boy! A wonderful project bag! I hope I win. Ack! Another chance at an Offhand Bag? It must be a birthday wish come true! What a nice gift/prize! Lovely bags. The Offhand design bags are the most beautiful bags there are. Amazing vintage material. Would love to own one! What a scrumptious bag! Just in time for the outdoor knitting season. Amazing bag! Thanks for the contest. Cool bag. Let’s take our knitting on the road this summer. So love the orange stripey one! I might not need more yarn, but another bag is always good. These bags are always gorgeous…would be lovely to win! Offhand has the best bags and fabrics around! These bags are stunning…I would be over the moon to win one! Beautiful! I’m in love with the Daphne and Hippodrome fabrics! Wow, lovely bag! Thanks for the giveaway. I would so love to own one of those beautiful bags. Wow awesome bag and fab giveaway! Ooooh how marvelous! I don’t have a knitting bag larger than for sock knitting so this would be an AMAZING treat. Thank you for the stupendous giveaway! Ooooooh! I am on the hunt for a new bag! This one is beautiful! Bring on the question!! And thanks for a fun blog!! This “bag lady” would love this bag. What a great gift. I can never have enough bags for knitting. They are gorgeous! What a beautiful bag. I love the Monterey one. Thanks for a great giveaway! I could put such a beautiful bag to good use. I would love to carry my knitting in it. What a lovely bag and generous give-away! Thank you on behalf of the lucky recipient, whomever that may be. What a gorgeous bag! This would be an awesome knitting class bag! Oooh, how lovely! Would be absolutely over the moon if I won this – it’s gorgeous! Oh, how I covet these bags! A beauteous bag! Would love to stuff some yarn in one! This is an amazing bag, what a generous giveaway. I’d love to win! I’m in the market for a new bag… I sure hope it gets to be this one! OHD bags are my favourites for their capacity and their construction. Very attractive bag. I’ve never tried the doctors frame style, but as a health care professional, it has a nerdy appeal. I love the Aurelia fabric too. Good luck to everyone in the draw (but I’m hoping it’s me)! Oh, that bag. I will fill it with heartbreaking yarn and knit publicly just because I can. Love those bags; thanks for the chance to win one! Love, love, love the bag! It is amazing. Oh my gosh! Pick me, pick me, pick me, pick me (breathe) pick me pick me pick me! Oh wow would I love to have that instead of dragging my computer bag to and from work. Thank you for the generous giveaway. What a cool-looking bag! I love the Izmir fabric combo. Absolutely gorgeous! My favorite colors! Would love to be the proud owner! Thank you! Looks like a nice bag! Off to read the review! Thanks for the contest! What a great giveaway! Thank you for having it … Woo hoo! I love that bag! I need that bag, lol! Love Love Love this bag!!! Not only beautiful, but amazing function!! Looks lovely – count me in, please! What a beautiful bag! Looks like it would be very useful! What an amazing bag! Thanks! That bag is beautiful. Just the thing for travelling knitting! Me, Please!!! Now that is a swank bag. Yes please! What a generous prize. I’d love to have a new summer bag. What a fabulous bag … WANT (please)! Fantastic giveaway! You guys are awesome! Don’t have many bags but I’d like to change that! Those are awesome! I’d love one. They’re such fun fabrics! That bag is so beautiful. Just imagining all the knitting it could inspire makes me happy. Thanks for the giveaway! So many lovely fabrics to choose from for this gorgeous bag!! Love my Switch case for interchangeables from Offhand, and this bag looks fabulous too! Marmara maybe. These are absolutely lovely! Wow, even if i dont win, i might have to buy one of these bags. Oh….. I LOVE her bags. Please, please, please number generator pick me! I’d love one of those bags! I’ve got a big trip planned in May so this would be great to take along. would love to get this bag! A truly beautiful thing. What beautiful bags! One would be great for travel! Ooh, pretty. I love me a good, practical bag. I own an Offhand Design bag and I love love love it. This bag is simply knitastically beautiful! Would be a great overnight bag and simply a bigger bag to carry my knitting. One can never have too many great knitting bags! This would be my dreambag…. Now those are great bags. Beautiful colors. 522 is my lucky number. Really. Wow, those are really pretty bags. And big enough to hold a sweater! What a fantabulous bag to hold all my knitting. I lust after this bag. I might just have to buy one if I don’t win. I never think of myself as someone who lusts after bags, but my instant response to seeing this bag brings my self-assessment into question! Ok, just the fact that the bag has the same name as the King of the Dragons in The Enchanted Forest series by Patricia Wrede is enough to make me drool. What a lovely bag! Can I fit diapers and my knitting? I have looked at these bags, drool I would not have the money to buy one. I would just love to have one. Beautiful! Especially Aurelia and Byzantine. Gorgeous bags! What a great prize. WoW! I could carry around a lot of stuff in that bag! I love these! I really want to win! Oh those are gorgeous. Please, infinitely wise number generator, pick me. That bag is awesome! Knitting bags may be my second favorite thing after yarn. Oh wow! That bag looks amazing. I’d love this bag. It’s so gorgeous! Oh, what a wonderful bag, and what a lovely knitty review. Please pick me, and thank you for the generous giveaway! I would love to win one of these bags!!! What neat bags! One could be a very practical replacement for my boring old bag I take to work every day (well, not really affordable at that price if I had to buy it). Does one ever have enough bags? beautiful! This would look so much nicer than my plastic grocery bags that I am currently using! Thanks for the chance. I’ve been eyeing these for some time – what a beautiful bag! I love love those bags! Thanks for hosting this give away. Wow, that bag is gorgeous! Thanks for the chance to win! A useful bag for putting things in. I would love an opportunity to win this lovely bag! I’m a sucker for gorgeous bags, and these fit the bill! I would love to win one of these bags! I love Offhand bags and I’d love to win one. That is a crazy generous prize for a giveaway. Offhand makes such gorgeous bags, I’m drooling on my phone. Fingers crossed for luck! Sweet bags, much nicer than my gallon zip lock project bags. What a beautiful bag! Thanks for the chance to win! I’m awaiting delivery of my second Offhand Designs bag…would love to win a third! Ah! What a gorgeous bag! Thank you for the opportunity to win it! This contest put a big smile on my face as my job of over 6 1/2 years was shipped to the phillipines. I could knit as I look for future employment! This would be a wonderful present for me–because it’s my birthday (yesterday). Fabulous bag and fabulous giveaway! I am so in need of a new bag! So pretty! love it, and I’m not normally a purse person — but this I would definitely wear! What a lovely bag! Yes please! It would be amazing to win this bag. I’ve been drooling over all the different ones on her website for a long time! What a great looking bag. I looked at the pattern choices and don’t know if I could pick one. All beautiful. Thanks for the chance to win! On cannot have too many knitting bags! Wow what a beautiful bag!! Thank you for such a generous giveaway. I love these bags and the wonderful Larisa! Absolutely love that they are designed in Oakland! I would be ecstatic to give this to my wonderful partner Claire, who I know would use it all the time for everything! Thanks for the chance to win one! Much love to Offhand Designs! Oh how I’d love to win an Offhand knitting bag. I have two and the most difficult part of placing an order is deciding the style and fabric. All are beautiful. What a fantastic prize! One can never have too many bags… especially gorgeous ones. Wow! How amazingly generous! I reallly loved the look of these bags in the review, anyone who owns/wins one is very lucky! What an awesome giveaway. I really want this bag. All the bags are so beautiful, I don’t know how anyone could have just one. It’s no wonder the bags are so popular. I’m in desperate need of a beautiful new knitting bag. Such a beautiful bag! I am always looking for new things to hold my projects. So many have commented which lessens my chances. Bugger. But just in case here goes – I have chosen the Kazul in Monterey. Thought I would shorten the process and let you know the bag I covet. It would be so exciting to win this bag! I really want one but it’s just too much for me to spend on a bag. The bags are lovely; I would love to win one! I love the look and functionality of this bag. It seems to be the perfect size too. I would love to win one. I’m a long time OHD fan. That is a FANCY bag. I love the Aurelia fabric option. These bags look positively sumptuous! I’ve been trying to decide on a knitting bag for a while and now I have even more to consider! I’ve admired Offhand bags from afar, I’d love to have my own! What beautiful bags!!! One can never have too many knitting bags!!! Oh, I’m such a sucker for bags. If I didn’t have a yarn stash, I’d have a bag stash! It would be a real treat to win the Voyager bag. Thank you for the opportunity. I need a new bag and a knitting bag would be even better, so if I won this it would be great! Yes, please! I would love one! Gorgeous bags, it will be hard to pick just one. Count me in. I have been drooling over this bag for weeks now! Love it! And love OHD. I love these bags! Especially the striped one. I could use a bag for my projects. Wow! Didn’t know these existed. Looks like an amazing bag! Never won anything from Knitty. This would be a wonderful bag to own so I am hoping! Beautiful as well as useful bags. Shame I’m across the pond and won’t have a chance of winning!! This is such a great looking bag! I hope whoever wins it enjoys it! I would love to win this gorgeous bag. The only challenge would be picking a color. There are many delightful choices. Pick me, please! It’s beautiful and I have recently had to retire two precious bags. 🙁 This bag would be loved. Those bags are lovely to look at and well designed also. I’d love to win one! And since I have a 50 plus year history of “overpacking” satchels and bags, this would be a welcome improvement on the ones I have been using. A truly fine bag is a dream. What a wondrous addition to my knitting glamor that would be! Can I say how much I love this bag?? I love, Love, LOVE it!!!! Was that enough loves? I hope so. Pick me, pick me. Oh, my I hope I win this one…what a gorgeous bag! I am off on a knitting retreat with 3 internet friends. This is our 11th year together. Let’s celebrate with a new bag!!!!!!!!!!!!!! I would adore one of these bags! I just can’t afford one, so hope that random generator is hot! These are beautiful bags! as a weaver who always has hand-finishing to do, and an obsessive knitter (and, to give my poor elbow a rest, a sometimes needleworker), I ALWAYS have need of another project bag. These are gorgeous and the giver is indeed generous. What a generous give away! Thank you! I always feel nervous about knowing the answer to the question if I should happen to be the chosen one. I love Offhand Designs’ fabric, and this is such a fab giveaway! What a wonderful generous gift, I would love to win such a bag. Cross my fingers!!! beautiful bag. What a great giveaway! Certainly this is more than just a bag! Beautiful designs and fabric done with style. Wow, that’s a beautiful bag! Wow, what a spectacular bag! I have been looking at lots of bags lately for a different project and this one really stands out. I’d love to win one, hope hope hope! That bag looks lovely! I hope whoever gets it enjoys it and puts it to good use! Those look like lovely bags! Wow, what a great bag! Thanks for the giveaway! What a gorgeous and functional bag! Kudos to the person who designed it! oooh, I would love one for toting my craftiness! 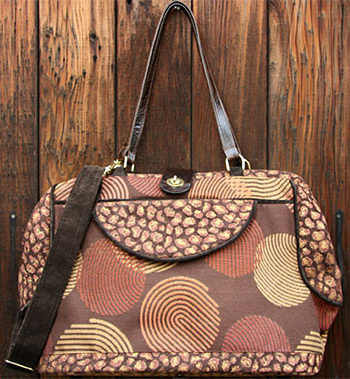 A bag that gorgeous is sure to impart a creative spark on the person carrying it! Audrey or Ravenna would be my pick. OMGOSH that is a fantastic bag! I’ve never had a high-end bag; maybe now is my time. 🙂 And it’s made in Oakland! I love bags and the dr frame in it launches it to the next level. What a great giveaway! I’d love to be the lucky winner. Those fabric choices are divine. What an amazing bag! Love love love!!! Fabulous bag! I can think of a million uses!! I would love to have such a beautiful knitting bag! Beautiful bag! Just what I need to wow my weekly knitting group. Hope I win. I think I’d go for Audrey! Thanks for the opp! I’ve been admiring their bags for years. Crossing my fingers! Oh I would love that bag- such a great giveaway! Thank you! I’d love to be the lucky recipient of this bag! Beauty!! One can never have too many knitting projects or too many bags to hold them! Gorgeous bags! I have been ogling them for quite sometime. I love the marriage of beautiful fabrics and functional sensibility! Winning one would indeed be something special. I enjoyed your review and loved the bag but knew there was no chance- now there is! Thank you. Beautiful bags – looks like excellent craftsmanship. So generous! Those are fantastic. Sign me up! Ooh ooh, yes please! I only get to lug around a baby changing bag just now with my wallet squeezed in the top, so it would be lovely to have a great bag of my own to fit knitting in! Absolutely fabulous bag! I looked at the fabric selection and I swear at least six of the bags were the perfect color — all six of them. What a gorgeous, practical bag! I can always use a new knitting bag and this one is lovely. Thanks for the chance! What an awesome-looking bag – thanks for having a giveaway! Gorgeous! I’d choose the Octavia — absolutely beautiful! But what a pretty bag waits! Yes please! Would my chances increase if I begged? The first time I’ve looked at the Knitty blog, and what a wonderful giveaway! Beautiful bag! Hope to win! Wow! Larisa is tops!!! What a fabo giveaway! Gorgeous bags, it would be such an incredible bag to own. Love love!!!! I’m feeling lucky! That is an extraordinary bag. Lovely bag and great taking your class at Yarnover this weekend! Wow, Offhand really does do some amazing bags! Why do I not have one yet? That is very odd – needs to be rectified. One can never have too many knitting bags! I would love to win one. I cannot leave the house without carrying snacks, meds, water, plus my normal purse things. This bag would carry it all! I’ve lusted after these bags forever…thanks so much for the chance at winning one! One can never have too many bags! and a pair of scissors in each. This bag looks awesome and there are so many things I could use it for. Thank you for the giveaway! Totally amazing bag! Thanks for this chance! Beautiful bags. Thanks for the chance to win one. I gave a thing for bags. This would be great! Simply beautiful. i love this bag and would love to win, thanks. This bag has my moms favorite colors and would be the perfect present for my mother. Beautiful – would love to win!! Wow! Just wow! That is lovely. Wow so generous! Their bags are very unique! I’d love a chance to win. This would be great for an upcoming trip; beautiful bag! I love the looks of this bag! So much better than carrying my knitting around in plastic ziplock bags! Beautiful bag and I have my fingers crossed! Lovely! Hope I can win one. Oooh, lovely bag! I’m always looking for better ways to keep my projects organized. Do I need a bag like this? Yes. Yes, I do. What an amazing bag! Such a great giveaway! What an incredible giveaway! Many thanks to Offhand Designs for the great prize. Holy moly, that looks awesome! Thanks so much for the chance to win one! I would freak out if I won this one thanks for the chance and God Bless. Wow! Would be difficult to choose. oh just the right size bag, digging it! I love this bag and I hope I win! I love the doctor bag frame too! Thank you so much for the chance to win this gorgeous bag! I am amazed at the amount of detail that goes into these bags. This looks wonderful! Thank you for the opportunity! What a great bag. I like the varied patterns. Now that is a lovely bag!!! Wow. Can’t have enough project bags! A good bag is worth it’s weight in gold! Ooo! Sweet!! Bren7na on ravelry. Thanks for the great blog first time to comment….have enjoyed visiting here! Pretty! Would love to have one of these. Fabulous bag and generous giveaway – thanks for the opportunity! Oh I’ve had offhand designs on my knitting wishlist for. ev.er.!!! Oh wow! And Aurelia is just stunning. And such a generous prize! I have been drooling over these bags for YEARS now, and I’d love to win one! I would LOVE to win this bag! It would certainly beat the plastic grocery sacks I am currently using. Wow! Just wow! So thankful for the generosity of this gift-away! I really hope to win this one. My gf loves bags. Always looking for a better way to carry my things! Beautiful bag. Hope I’m the lucky one. What a gorgeous bag! Would love to win it. I’ve never actually had a bag like this, that was made for knitting but also to look classy. I’d love to try it out. That’s the perfect bag! I would have enough room for my tools as well as my knitting – and I’m finishing up my school for NP so I really do have tools to put into it. Thanks for the chance to enter! What a lovely bag. I can think of many, many uses for it. That looks stunning and I love OHDs bags! Gorgeous bag! What a great give away. This is a beautiful bag and it has all the right colors for spring. I’m purse obsessed. I would love to have this beautiful bag. My mom has been teaching me to knit, I have always wanted to learn since I was a little girl and used to watch her. So exciting! 🙂 I could use this bag to help me out with all this stuff! What a lovely bag for carrying stuff(and I always have a lot of stuff to carry)! I would love to have a new handbag. I love these bags! What a great giveaway – thank you! A beautiful bag and a very generous donation. I have been looking for a new bag and this would be perfect! What a beautiful bag! I would be so thrilled to win it! Offhand Designs make some beautiful bags. Thank you for opportunity to actually own one. Wow!! I love these bags! I love the colors and the the style fits my personality! Would be an excellent addition to my project bag collection! What a beautiful bag! One can’t be enough! 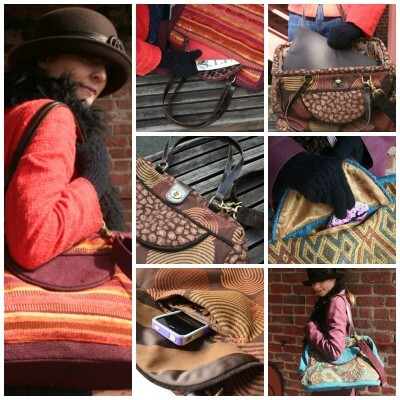 All of the Kazul bags are stunning! It will be a difficult for me, especially if I won such a great and fabulous prize. Also, this bag would be perfect for me since I work 6 days a week and sometime have to crash at my moms house. Just think!!! How many knitting projects I can get in that beautiful bag! This bag rocks! You could travel with it and know you have everything with you that you need. Nothing more you could want. I love the doctors frame design. It’s very nice and I especially like the BYZANTINE pattern. I would love to win this! I mean, come on…who wouldn’t?! I absolutely love this bag! I knit all the time and it would be perfect for keeping all my knitting supplies in. That’s the most gorgeous knitting bag I’ve seen! Off Hand Designs bags are the best bags ever! And Larissa is a talented designer and a wonderful person. I’m so glad you’re supporting her amazing business. I love, love, love this bag, and it will definitely become my favorite should I be lucky enough to win. I’ve never won anything related to knitting, not for lack of trying. This bag is the cat’s meow for sure! these are very pretty i hope i win! Coveted! What a striking bag. BEAUTIFUL BAG & GREAT DESIGN. Oh Those are beautiful bags! Thanks for the chance to have one. Love all of the Offhand Designs bags, and this is the best yet! What a beautiful discovery! These beautiful and functional! Stunning way to carry it all!!!! Love the bag. Thanks for the chance! this knitting knurse would love a bigger bag for my knitting!! thank you for this chance. Those bags look lovely! What a generous gift! Thanks for the opportunity to win such a beautiful bag. That beautiful bag and I would go together like peas and carrots! Thanks for the opportunity to win it. I love this bag! Offhand Designs are the best. I have had my bag for 4 years and it still looks great. This is a gorgeous bag, My mom would love it! The skills question should prove interesting, but I already have those “pre-test” butterflies in my tummy. Thanks for the opportunity. Perfect for travelling with yarn! What a great bag! Hope to win! Wow… Those bags are beautiful! Beautiful bag. I love the shape. I look forward to each issue of knitty. Thanks. This bag is absolutely beautiful. I hope I win it. If I don’t , I may have to save for it. Thanks to Knitty and their sponsors for offering such great givaways. I would love to win this bag. it’s beautiful! I really like this bag. It’s so roomy! Plus, the designs are so cute! That’s a beautiful bag! Love the Offhand Design bags, but my beer budget can’t afford them! This bag is so cute! If I win, I want to give it to my mom for mother’s day! I think she’d love it! These bags are so gorgeous! My birthday is coming up too. Thanks for the opportunity to win such loveliness! Wonderful bag, and great fabrics. My faves are Aurelia and Daphne. Thanks for another generous giveaway. These bags look fantastic. Great design, and quality crafts(wo)manship. Thanks for holding the contest! I would love this bag. It would be great to take as a carryon on an upcoming trip. I love this bag! Thank you for the opportunity to win! I’m a little bit of a bag whore…. I can never have too many and this one is beautiful! Please pick me! 🙂 I love the bag in Aurelia. I don’t believe I read that article in the last Knitty but now I think I need to! That is a gorgeous bag and it would look lovely holding some of my favorite works-in-progress. that bag is stunning! I would love to add it to my collection! This bag is so lovely, who wouldnt love to own it? This is such a beautiful bag! Thank you for the opportunity to win. This bag is the greatest! Since I take knitting every time I get in the car,(even when I’m the driver) would love carrying this along!!! Never know when there will be a traffic jam – here???? I really love this big and beautiful bag, it would be great for traveling. Gorgeous bag, hopefully you’ll see it draped over my shoulder soon! Thanks for the chance to win a bag! Nothing like sneaking in a comment at the last moment… These bags look fantastic! What an amazing giveaway! Thanks for the opportunity to win! Oh my! I’m so happy that I got back to the computer tonight, to see the wonderful contest offering here. I’m crossing my fingers (and toes too) and hoping to win. What a gorgeous bag! Would love to have it. That is a good bag. I could have used it this weekend at our fiber conference. That handbag is just beautiful. I know I would love it. Thanks for having this contest. My wife loves the design of this bag. awesome giveaway:) The bag looks very roomy:) Gl all!